The KBC Bank is taking additional security measures after being targeted in a suspected arson attack. The lobby of the city centre building was set alight following a week of heightened tensions and protests at other KBC buildings in relation to the controversial eviction in Strokestown, Co Roscommon. On Thursday night, an object, believed to be a rock, was thrown through the window of KBC offices on Sandwith Street in Dublin 2. A small fire was then started in the lobby area but was quickly extinguished by the Dublin Fire Brigade (DFB). No arrests have yet been made, and officers attached to Pearse Street garda station are investigating. Members of the Garda Technical Bureau were at the scene yesterday to carry out an extensive forensic examination of the building. Staff at the bank were able to attend work as normal yesterday, but a section of the offices remained cordoned off for Garda examinations. A Garda spokeswoman said: "Gardaí in Pearse Street are investigating an incident of criminal damage at a premises on Sandwith Street, Dublin 2, on December 20, 2018. "The incident occurred at approximately 11.25pm. "Dublin Fire Brigade also attended the scene and extinguished a fire in the lobby of the premises. 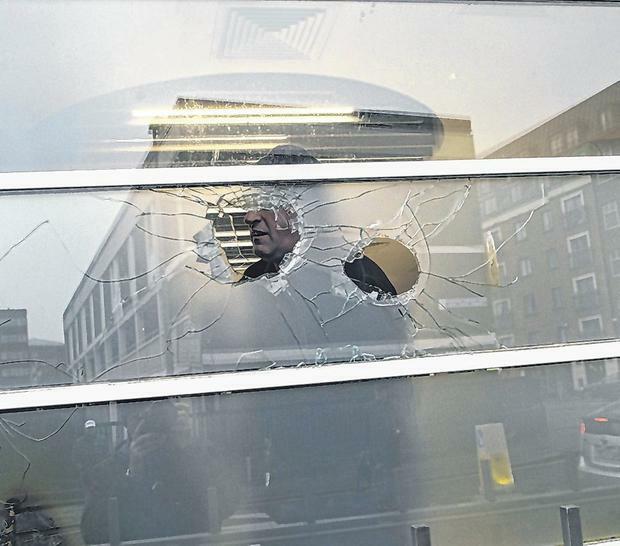 "Windows were also damaged in the incident." Following the attack on the bank's Dublin headquarters overnight, KBC Ireland confirmed it is taking extra security measures to protect staff. "Our staff's safety is of the utmost importance to us," a spokesman for the bank said. "We have taken additional measures to ensure that our people feel safe in their work,". Protests have been held at KBC Bank buildings in recent days following an eviction in Strokestown, Co Roscommon, on Tuesday of last week. Farmer Anthony McGann and his two siblings were evicted by a security company following a repossession order of their Falsk home. The following Sunday, a group of between 20 and 30 men, some carrying baseball bats, stormed the property and attacked eight security workers guarding the land. An investigation into the violence is ongoing which also involves national garda units. Two men arrested in connection with the incident have been released without charge.